The nonrenewables have unique attributes not addressed elsewhere: they are typically hidden in the earth's crust, thus making it difficult to quantify their physical stocks, and many of them are irrevocably depleted. These crucial factors call for additional discussion. As an example of supply uncertainty, consider coal, which is currently making a huge comeback despite its devastating ecological consequences. The longstanding assumption has been that, even at high rates of use, there is sufficient coal in the ground to serve humankind for more than 200 years. Several recent developments, however, paint a different picture. The price of coal has increased five-fold since 2002, but reserves have continued to fall, indicating that coal extraction is starting to encounter geological limits. Even though we cannot be certain about a nonrenewable's ultimate quantity, we do know that this stock can be depleted, at least in the economic sense. This is especially true for resources that cannot be recycled or re-used, such as the fossil fuels and the minerals used in fertilizers and pesticides. The unavoidable and remorseless nature of this depletion means that present humankind has an ethical responsibility to the future with respect to these flows. We might therefore ask if it is a mistake to lump the nonrenewable flows with the biological flows in determining target flow rates. Perhaps a different utilization pattern should apply to nonrenewables in recognition of their unique attributes. To explore this possibility, we will examine an important alternative to ENL's approach: the oil depletion protocol. Although the protocol applies specifically to petroleum and natural gas, the principle it embodies could be applied to nonrenewables generally. A numerical example will clarify this statement. Assume that the world's present stock of oil is 1,000 units, and that we are using 50 units per year. This means we are currently depleting oil at an annual rate of 5%. In this situation the protocol says that each country must reduce its annual use of oil by 5% or more. If the world as a whole chooses the minimum permissible reduction, this means that next year we will use 95% of 50 units, or 47.5 units. The following year we will use 95% of 47.5 units, or 45.1 units. If this pattern is continued, in year 10 we will use 30 units of oil, in year 30 about 10 units, and in year 50 about 4 units. The oil stock will never be entirely depleted, and our annual utilization will move towards zero as we shift to a lower-energy lifestyle. At first glance this protocol appears to be an excellent principle for the global transition to a post-petroleum future. However, it is unsatisfactory for two reasons: it is arbitrary with respect to health (or any other criterion of well-being), and its flow reduction is far too slow, particularly over the short run. Regarding the first objection, assume that the world will require only 30 units of oil to maximize its health in the second year. The protocol lets us use 47.5 units, so depletion will likely be much faster than is necessary. Assume further that, 50 years from now, the world will need 10 units of oil for health maximization. The protocol lets us use only 4 units, so depletion will be slower than necessary and global health will suffer. Conforming to the protocol could thus mean excessive short-term utilization of oil and inadequate long-term utilization, neither of which is optimal from the health perspective. This minimum figure has a sound basis, and some countries might agree to it, but why would any country, or the world as a whole, decrease its utilization rate more quickly? Campbell doesn't address this question in the protocol statement itself, and Heinberg refrains from commenting in his book. While heroic measures by progressive societies are always possible, the protocol does not offer a rational economic reason to cut oil use by more than the minimum percentage specified. To visually gauge if a 2.6% annual decrease constitutes a "crash program", examine the following figure, which applies this rate of decrease to the European Union's current oil use — about 15 million barrels per day — for the next 20 years. 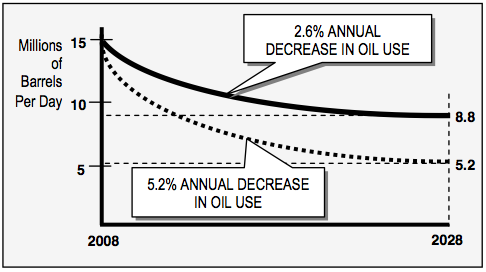 The oil depletion protocol would mandate an annual decrease in oil use of at least 2.6%. However, even double this rate does not constitute the radical decline that is needed. We must achieve a sharp break from past patterns of resource utilization, which the protocol fails to encourage. After 20 years the EU's annual oil use will have gone down by only 41%, to 8.8 million barrels annually. Even if we double the annual decrease to 5.2%, after 20 years oil use will still be at 5.2 million barrels a year — a 66% decline. If we did want to achieve a decline of 90%, which might reasonably qualify as the "radical conservation" Heinberg has proposed, this would take 87 years at an annual decrease of 2.6%, and 43 years at 5.2%. If we decided that a 90% reduction within 10 years is what the world really needs, this would require a 20% annual rate of decrease in oil use. Such a reduction is about eight times the current world depletion rate of 2.6% and would be extremely difficult to justify on this basis. The problem of a too-gradual decrease in resource use afflicts any principle that applies a percentage decline to current utilization rates. Such approaches are far too conservative: they fail to recognize that current rates are utterly irrational and that rapid adjustments are required, which for the rich countries means massive short-term cuts. Principles such as the oil depletion protocol might be considered realistic and politically achievable, but they will nevertheless act as impediments to the fundamental changes that are now clearly necessary. To illustrate this point, consider the EU oil example again, but this time with respect to the amount of oil utilized. If the protocol is applied and utilization is reduced at the minimum 2.6% annually, Europeans will use about 245 million barrels of oil by 2028. If the ENL pattern is followed instead, with a sharp 90% utilization decrease in the first 10 years and a gradual 0.5% decrease in the next 10 years, Europeans will use only 84 million barrels. The difference of about 160 million barrels of oil would constitute an extraordinary "gift" to future humankind — one that could mean the difference between reconstituting tolerable conditions quickly after a collapse, and living in unbearable conditions for centuries to come. Alternatively, the latter consumption pattern could be construed not as a gift, but as the cessation of the ravenous theft from the future that William Catton has correctly ascribed to present humankind. 1. "The great coal hole", David Strahan, New Scientist, Jan. 19, 2008, p. 38. Strahan is a useful source of information on peak oil and energy issues. See his book, The Last Oil Shock: A Survival Guide to the Imminent Extinction of Petroleum Man (London: John Murray, 2007). Chapter 5: "Last Oil Shock, First Principles" convincingly demonstrates that standard economics, in part because of Robert Solow’s superficial growth model, has massively underestimated the significance of energy for capitalist growth. 2. Richard Heinberg, The Oil Depletion Protocol: A Plan to Avert Oil Wars, Terrorism and Economic Collapse (Gabriola Island: New Society Publishers, 2006). 3. Ibid., 155. The full protocol is included as an appendix to Heinberg's book. It can also be found on the web by searching on "oil depletion protocol". Note that the term "consumption" is used in ENL only in the context of final outputs. In standard economics, however, the term is used for both end-user consumption and "productive consumption". The latter meaning is employed in the protocol statement. 4. Heinberg, Ibid., 78. This is Colin Campbell's estimate. 5. Richard Heinberg, The Party's Over: Oil, War and the Fate of Industrial Societies (Gabriola Island: New Society Publishers, 2005), 4.